The COAS interacted with local tribal elders and representatives of the sit-in, a news release of Inter Services Public Relations said. the COAS in taking care of the victims and the affected families. succeed to lower our resolve or to divide us” the COAS said. 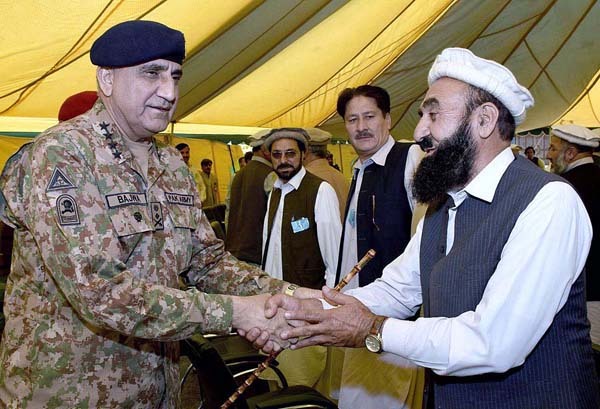 tribes and sects performing their duties selflessly,” the COAS said. Pakistanis and Muslim,” the elders remarked. locals are part of the security and vigilance,” the COAS said. apprehended who will be tried in military courts. also being dovetailed on check posts. line with the ones in Lahore and Islamabad will be undertaken. including in Baluchistan will be fenced in Phase 2. Shaheed and it will be upgraded to Cadet College in due course. bring back normalcy in the country. has an agenda of exploiting sectarian fault-line. required in this regard” the COAS said. and IGFC KP were also present at the occasion.